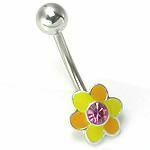 All you need is love with this darling hippie love flower navel ring. With its summer lovin' citrus colors of yellow and orange, spread the peace and love anywhere you go. Lets not forget the stunning rose pink gem middle for a little summer flare.